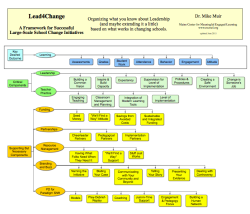 How might leadership be different for large scale school change? Large scale school change, change that really redefines the way things are done in school, or changes we ask of educators that they may not have ever experienced themselves as learners, requires careful attention to implementing the right components in a thoughtful way. The model of leadership for school change below describes the multiple elements leaders should attend to in order to create change that sticks. This model for effectively leading large-scale initiatives has evolved over years working in real schools to implement learning-focused school change. Information about earlier versions of this work is below. Can Mike Help Your School?